Here’s how to have accountability. Editor’s note: This post was originally published in June 2015 and has been updated for freshness, accuracy and comprehensiveness. Is thankfulness a survival skill? Maybe most of you would respond with, “No, thankfulness is not a key to survival,” and I would tend to agree with you. Most of us have probably already solved the necessary problems of survival, gone beyond that and are now working to achieve our desires. But let me give you this key phrase, “Learn to be thankful for what you already have, while you pursue all that you want.” I believe one of the greatest and perhaps one of the simplest lessons in life we can learn is to be thankful for what we have already received and accomplished. Both the years and the experiences have brought me here to where I stand today, but it is the thankfulness that opened the windows of opportunities, of blessings, of unique experiences to flow my way. My gratitude starts with my parents who raised me, gave me an incredible foundation that has lasted me all of these years and continues with the mentors that I’ve met along the way who absolutely changed and revolutionized my life, my income, my bank account, my future. I am also very thankful for the people, the associations, for the ideas, for the chance to work and labor, and to produce results. I’m grateful for it all. Now thankfulness is just the beginning. Next, you’ve got to challenge yourself to produce. Produce more ideas than you need for yourself so you can share and give your ideas away. That is called fruitfulness and abundance—it means working on producing more than you need for yourself so you can begin blessing others, blessing your nation and blessing your enterprise. Once abundance starts to come, once someone becomes incredibly productive, it’s amazing what the numbers turn out to be. 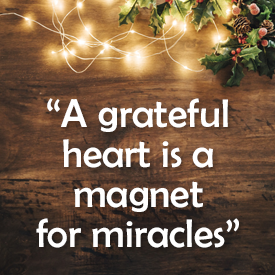 But to begin this incredible process of blessing, it often starts with the act of thanksgiving and gratitude, being thankful for what you already have and for what you’ve already done. Begin the act of thanksgiving today and watch the miracles flow your way. Through over-reimbursement and under-reimbursement, Medicare Advantage — the first real “retail” health insurance market of scale — has consistently penetrated the Medicare marketplace over the past 20 years. And it shows no sign of slowing down. 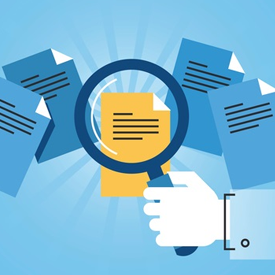 For payers, that means finding ways to drive growth of their Medicare Advantage offering. For providers not already contracting with Medicare Advantage, it’s time to bite the bullet and either figure out an effective business model or consider launching their own plan. 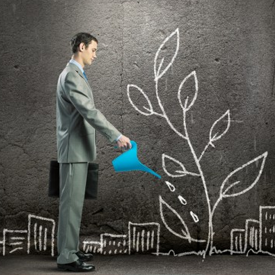 For investors, this is a macro trend and as such, a long-term opportunity. To be sure, the penetration rise has been measured at just 1.5 percentage points per year over the past 10 years. But accounting for recent trend and other market dynamics, L.E.K. Consulting’s proprietary county-level projection model shows Medicare Advantage enrollment rising from roughly 20 million, or 35% penetration, at the end of 2017 to approximately 38 million, or 50% penetration, by the end of 2025. Nor will it stop there. Indeed, we believe that Medicare Advantage’s march forward will continue apace until its penetration rate hits 70%. Medicare Advantage is one of the rare products in the U.S. healthcare system that not only satisfies the “triple aim” of healthcare improvement — that is, improving the experience of care and the health of populations while reducing per capita healthcare costs — but also appeals to the self-interests of three very powerful constituents that have been driving its march forward: consumers, health plans and the government. Consumers like Medicare Advantage plans because they offer predictability, additional benefits, care coordination and lower estimated total annual healthcare costs than are offered by either Original Medicare or Medicare Supplement plan options. Over the past 20 years, enrollment in Medicare Advantage plans has grown at a slow but steady pace. The sole aberration in consistent growth occurred between 1999 and 2002, when the Balanced Budget Act led to the loss of Medicare Advantage plan options for some 20% of the covered population. As a result, the proportion of Medicare beneficiaries with access to a Medicare Advantage plan — then known as Medicare+Choice — fell from 72% in 1999 to 61% in 2002. Enrollment dropped 21%. As soon as access was restored by way of the 2003 Medicare Modernization Act, penetration quickly reverted back to the trend line. Indeed, even the reimbursement cuts that resulted from the Affordable Care Act — which reduced average Medicare Advantage reimbursement from underlying fee-for-service costs plus 12% in 2011 to parity with underlying fee-for-service costs by 20171 — have not impacted the steady growth. We expect Medicare Advantage to continue its slow but steady growth, reaching 60% to 70% penetration sometime between 2030 and 2040. We base our forecast on a number of factors, among which are that several urban and rural counties not only have already achieved a Medicare Advantage penetration rate of 55%-65%, but their penetration rates continue to grow at a weighted-average 1.0 percentage point per year. Where will the penetration come from? 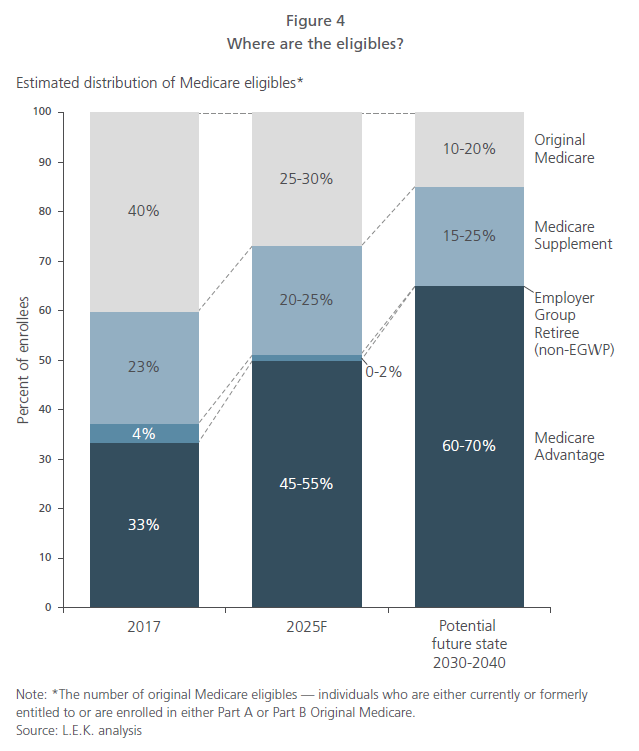 Much of it will come from Original Medicare, which could decrease more than 20 points, from 40% to 10%-20% penetration (see Figure 4). Seniors with Original Medicare will likely find their 20% coinsurance responsibility more burdensome as healthcare expenses continue to increase. According to the Kaiser Family Foundation, expenditures for physician and other professional services increased approximately 5.4% per year from 2000 to 2014, while expenditures on prescription drugs and other medical nondurables increased 6.2% per year. If healthcare costs continue to increase, a senior on Original Medicare could be responsible for significantly increased out-of-pocket spend. Ongoing increases in age-related chronic conditions will likely convince seniors and soon-to-be seniors that they need the degree of care management Medicare Advantage plans provide. The number of seniors with multiple chronic conditions increased by approximately eight percentage points from 2000 to 2010, according to the Centers for Disease Control and Prevention. Meanwhile, United Health Foundation notes that the population about to turn 65 is seven percentage points more likely to be obese and six percentage points more likely to have diabetes than those who turned 65 in 1999. L.E.K. conducted a proprietary study and found that roughly 20% of seniors exhibit behavioral factors that would suggest that a Medicare Advantage plan would be their best-fit product; however, they end up defaulting to Original Medicare. These seniors exhibit “concerned but uninformed” tendencies — in other words, they are often worried about their health but aren’t proactive about seeking health or plan information. As such, they are likely to respond positively to outreach and guidance, as they are unlikely to have made a conscious and well-informed decision to remain in Original Medicare (which is why they can also be referred to as “defaulters”). Meanwhile, the future of Medicare Supplement, which is used to help pay some of the costs that Original Medicare doesn’t cover, is less certain. Medicare Supplement plans face headwinds similar to Original Medicare, such as higher medical costs and an increased desire for care coordination while offering a similar lack of strategic levers to manage healthcare spend. Seniors confronted with increases in premiums could be forced to look elsewhere. Furthermore, a provision in the Medicare Access and CHIP Reauthorization Act (MACRA) bans Medicare Supplement insurers from selling any Medicare Supplement policy that covers the annual Medicare Part B deductible (i.e., first-dollar coverage) to new Medicare enrollees starting January 1, 2020. This impacts Plan C and Plan F offerings, the most popular Medicare Supplement choices today. The MACRA provision was designed to combat notoriously high healthcare utilization of Medicare Supplement members with first-dollar coverage and increase Medicare Supplement purchasers’ “skin in the game.” Analysts outline that the policy could change Medicare Supplement buying behaviors and potentially lead more seniors to choose a Medicare Advantage plan. As the Medicare Advantage market matures and its relative value proposition becomes clearer, two segments where Medicare Advantage penetration has historically lagged — dual eligibles and employer groups — are rapidly catching up. “Dual eligibles” is a term used to encompass Medicare beneficiaries who also receive Medicaid assistance. Medicare Advantage penetration of dual eligibles, who represent roughly 20% of Medicare eligibles, has lagged MA penetration of overall seniors due to a lack of coordinated state offerings and managed care. However, states are moving aggressively to manage the cost of these high-needs populations. For example, dual demonstration plans are now available in 10 states, fully integrated dual eligible (FIDE) special-needs plans have increased enrollment at 11% per annum since 2012, and Programs of All-Inclusive Care for the Elderly (PACE) have increased enrollment programs at 10% per annum since 2012. States with mature dual eligibles managed care programs are also increasingly inclined to move to passive enrollment, which could rapidly accelerate penetration of this segment. Retirees with employer health coverage are another group for whom Medicare Advantage penetration has lagged Medicare Advantage penetration of overall seniors. Approximately 20%-25% of seniors have group retiree coverage from their employer. This population is increasingly expected to join Medicare Advantage as employers transition from retiree drug subsidy (RDS) plans to Medicare Advantage employer group waiver plans (EGWPs) and as employers stop offering group retiree health coverage. Medicare Advantage penetration has grown at a slow but steady pace over the past 25 years. As seniors increasingly eschew Original Medicare in favor of lower payments, better care management and more certainty in costs, with encouragement from both health plans and, albeit indirectly, the government, we expect that growth to continue — to 50% penetration by 2025 and, eventually, all the way to 70%. With that in mind, payers will need to find ways to grow market share of their Medicare Advantage offering — for example, by expanding into new counties, investing in targeted sales to age-ins and adjusting product design to attract new members. And providers that have so far elected not to participate in Medicare Advantage will need to reconsider their stance and figure out a way to win with payers. Some may want to consider whether — and, if so, how — to develop provider-sponsored plans of their own. Investors, meanwhile, should be on the lookout for the vendors poised to support Medicare Advantage’s continued growth — by offering payers superior care management, member engagement, sales and marketing, and other capabilities to boost growth and profitability. Medicare Advantage will soon become the predominant Medicare product offering. It’s time to strike while the iron is hot. WOONSOCKET, R.I. and HARTFORD, Conn., Dec. 3, 2017 /PRNewswire/ -- CVS Health (NYSE: CVS), a company at the forefront of changing the health care landscape, and Aetna (NYSE: AET), one of the nation's leading diversified health care benefits companies, today announced the execution of a definitive merger agreement under which CVS Health will acquire all outstanding shares of Aetna for a combination of cash and stock. Under the terms of the merger agreement, which has been unanimously approved today by the boards of directors of each company, Aetna shareholders will receive $145.00 per share in cash and 0.8378 CVS Health shares for each Aetna share. The transaction values Aetna at approximately $207 per share or approximately $69 billion1. Including the assumption of Aetna's debt, the total value of the transaction is $77 billion. This transaction fills an unmet need in the current health care system and presents a unique opportunity to redefine access to high-quality care in lower cost, local settings whether in the community, at home, or through digital tools. CVS Health President and Chief Executive Officer Larry J. Merlo said, "This combination brings together the expertise of two great companies to remake the consumer health care experience. With the analytics of Aetna and CVS Health's human touch, we will create a health care platform built around individuals. We look forward to working with the talented people at Aetna to position the combined company as America's front door to quality health care, integrating more closely the work of doctors, pharmacists, other health care professionals and health benefits companies to create a platform that is easier to use and less expensive for consumers." This is a natural evolution for both companies as they seek to put the consumer at the center of health care delivery. CVS Health has steadily become an integrated health care company, and Aetna has moved beyond being a traditional insurer to focus more on consumer well-being. "This is the next step in our journey, positioning the combined company to dramatically further empower consumers. Together with CVS Health, we will better understand our members' health goals, guide them through the health care system and help them achieve their best health,"
said Mark T. Bertolini, Aetna chairman and CEO. "Aetna has a proud tradition of continually innovating to address unmet consumer needs and providing leading products and services to the marketplace." Bertolini continued, "Aetna has a talented and dedicated group of employees working to build a healthier world every day. Our combined company will be more competitive in the marketplace and accelerate progress toward achieving this mission." Today, increasing numbers of consumers are taking on more and more responsibility for paying for their health care as the burden of costs is being shifted to them. Together, CVS Health and Aetna will be a trusted community partner who will help consumers better manage the cost of the health care they need. The combined company will also be well positioned to more effectively meet the health needs of many more people, especially the 50 percent of Americans with chronic conditions that account for more than 80 percent of all health care costs. Finally, capabilities developed following this transaction will directly benefit clients of both companies and enable them to better manage their health care costs. Consumers will benefit from a uniquely integrated, community-based health care experience. The combined company will also be able to better understand patients' health goals, guide them through the health care system, and help them achieve their best health. There will be expanded opportunities to bring health care services to consumers every day. CVS Pharmacy locations will include space for wellness, clinical and pharmacy services, vision, hearing, nutrition, beauty, and medical equipment, in addition to the products and services our customers currently enjoy. An entirely new health services offering available in many locations will function as a community-based health hub dedicated to connecting the pathways needed to improve health and answering patients' questions about their health conditions, as well as prescription drugs and health coverage. This personalized health care experience will be delivered by connecting Aetna's extensive network of providers with greater consumer access through CVS Health. This includes more than 9,700 CVS Pharmacy locations and 1,100 MinuteClinic walk-in clinics as well as further extensions into the community through Omnicare's senior pharmacy solutions, Coram's infusion services, and the more than 4,000 CVS Health nursing professionals providing in-clinic and home-based care across the nation. As a result, there will be a better opportunity to utilize local care solutions in a more integrated fashion with the goal of improving patient outcomes. The entire health care system will also benefit from broader use of data and analytics, leading to improved patient health at substantially lower cost. This will be achieved, for example, by helping patients avoid unnecessary hospital readmissions. Twenty percent of Medicare patients are readmitted to the hospital soon after being discharged at significant annual costs, much of which is avoidable. Readmission rates can be cut in half if patients have a complete review of their medications after discharge from the hospital to help them manage their care at home. In addition, home devices to monitor activity levels, pulse, and respiratory rates can be used to prevent readmissions. Rather than feeling lost and confused, selected high risk patients discharged from the hospital, or their caregivers, will be able to stop at a health hub location to access services such as medication evaluations, home monitoring and use of durable medical equipment, as needed. All of these services will complement and be integrated with the care provided by their physician and medical team. The combined entity will be able to help address the growing cost of treating chronic diseases in important ways. For example, there are 30 million Americans suffering from diabetes, costing the health care system approximately $245 billion annually. Patients with diabetes will receive care in between doctor visits through face-to-face counseling at a store-based health hub and remote monitoring of key indicators such as blood glucose levels. When needed, patients can receive text messages to let them know when their glucose levels deviate from normal ranges. As a follow up, patients can receive counseling on medication adherence, pick up diabetes-related supplies and engage ancillary services such as counsel on weight loss and programs designed to reverse diabetes through nutrition. This will result in better control of their blood sugar levels and better health, which should be appreciated by both patients and their doctors. "These types of interventions are things that the traditional health care system could be doing," commented Merlo, "but the traditional health care system lacks the key elements of convenience and coordination that help to engage consumers in their health. That's what the combination of CVS Health and Aetna will deliver." As a result of this transaction, shareholders are expected to benefit from a number of outcomes, including enhanced competitive positioning; low- to mid-single digit accretion in the second full year after the close of the transaction, including the ability to deliver $750 million in near-term synergies; and a platform from which to accelerate growth. The combination over the longer term has the potential to deliver significant incremental value as it will spur the development of new products and generate significant new growth opportunities as a uniquely integrated retailer, pharmacy benefits manager and health plan. Aetna shareholders will receive attractive value from the transaction, including $145 per share in cash, and the ability to participate in the future success and high growth potential of the combined company. Under the terms of the merger agreement, each outstanding share of Aetna common stock will be exchanged for $145.00 in cash and 0.8378 shares of CVS Health common stock. Upon closing of the transaction, Aetna shareholders will own approximately 22% of the combined company and CVS Health shareholders will own approximately 78%. The transaction is expected to close in the second half of 2018. It is subject to approval by CVS Health and Aetna shareholders, regulatory approvals and other customary closing conditions. Upon the closing of the transaction, three of Aetna's directors, including Aetna's Chairman and CEO Mark T. Bertolini, will be added to the CVS Health Board of Directors. In addition, members of the Aetna management team will play significant roles in the newly combined company. Aetna will operate as a stand-alone business unit within the CVS Health enterprise and will be led by members of their current management team. Barclays and Goldman Sachs are serving as financial advisors to CVS Health, and Centerview Partners also provided financial advice to the CVS Health Board of Directors. The company was advised on legal matters by Shearman & Sterling LLP, Dechert LLP, and McDermott Will & Emery LLP. Lazard and Allen & Company LLC are serving as financial advisors to Aetna and Evercore is serving as financial advisor to Aetna's Board of Directors. Davis Polk & Wardwell LLP is acting as Aetna's legal advisor.